WASHINGTON (CNN) - United States' Ambassador to the United Nations Nikki Haley said Sunday the Trump administration will announce more sanctions against Russia as soon as Monday. On CBS's "Face the Nation," Haley said the Treasury Department will announce the new sanctions and insisted the US has sent "a strong message" about the use of chemical weapons. "You will see that Russian sanctions will be coming down," said Haley, reiterating what she said earlier on Fox News. "Secretary Mnuchin will be announcing those on Monday, if he hasn't already." While insisting the action taken early Saturday morning in Syria was "a very strong attack on the chemical weapons program," Haley hit back on more hawkish critics who argue the US didn't go far enough because it did not change the balance of power in the long-running Syrian civil war. "Our job was never to take Assad out," Haley said, referring to Syrian President Bashar al-Assad. She added that the conflict must ultimately be resolved through a UN-led political process. "Our job was never to start a war." Haley also said the response by the Trump administration was "cumulative," taking into account not only the recent chemical weapons attack in Douma, but also other, smaller, attacks. The action, she added, came after diplomatic options had been exhausted. When asked on "Fox News Sunday" about "how our relationship with Russia has changed this week," Haley said that relations are "very strained." 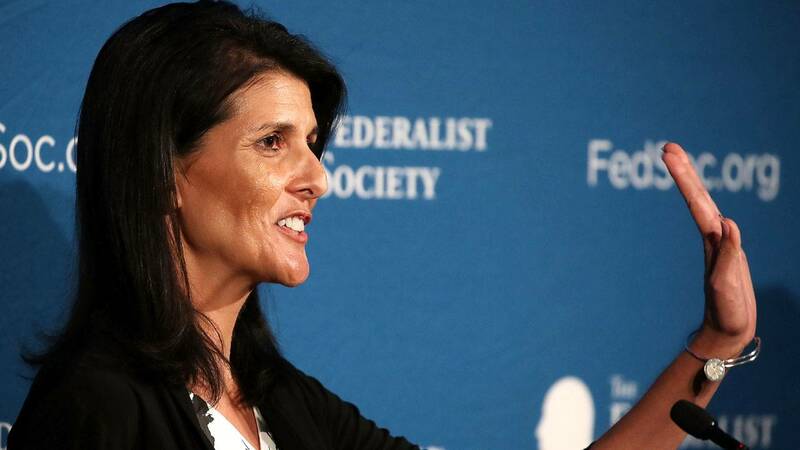 "If you look at what Russia is doing, they continue to be involved with all the wrong actors, whether their involvement in Ukraine, whether you look at how they are supporting Venezuela, whether you look in Syria and their way of propping up Assad and working with Iran, that continues to be a problem," Haley said, adding that the use of a poisoning agent against a spy in England is "another issue." She added that Russia is feeling the effects of US actions including "the sanctions that are continuing to happen, which you'll see again on Monday." "Right now they don't have very good friends and right now the friends that they do have are causing them harm," Haley said, referring to Russia. "I think they're feeling that." Haley also said that although "it is all of our goal to see American troops come home," the United States won't leave Syria before accomplishing President Donald Trump's three major goals: eliminating the threat of chemical weapons attacks in Syria, defeating ISIS "completely and wholly," and making "sure that we had good grounds to watch what Iran was doing. ..."
"What (Trump) has done is talked to our allies and said they need to step up more. They need to do more. And it shouldn't just be us doing it. I think that's the right approach," Haley added. "But be very clear, if we leave, when we leave, it will be because we know that everything is moving forward." CORRECTION: This story has been updated to reflect that sanctions against Russian companies that sell helicopters and helicopter parts to Syria are under consideration.